For once I’ve remembered to change the clock on the four digital cameras – two Nikons and two Fujis – that I use regularly before taking pictures with them. Most years after we have either put the clocks on or back it has been a month or so before I’ve got all of them sorted out, which has occasionally given some odd results, particularly when I seem to have taken things before they happened. I had to make another time change around a week ago, as the clocks on the two Nikons – D700 and D800E – don’t keep good time. Both had gone a minute or two out, though not by the same amount, which was beginning to get annoying when editing work taken when using both of them. It’s useful when you use ‘Sort by date’ in Lightroom to have the times more or less the same. Back in the old days, we didn’t have to worry about such things. Cameras didn’t even have batteries let alone clocks. And when cameras did start having batteries, all they powered were exposure meters. Then you had to remember to change these at least on an annual basis – I used to make my birthday a day to do this. Then came cameras that had auto-focus and power wind and you needed to pack spare batteries in your camera bag, though they were small and took up little space. Now with the Fujis you need to change the batteries every hour or two. The Nikons are rather better, and I can only remember having to change a battery while out taking pictures once in the past year. When I get home I look at the battery level and if it is below 80% it gets recharged. With the third party batteries (cheap replacements) if I’ve not taken much they can still be at 100%, as they have higher capacity than the genuine Nikon ones. Batteries are one thing that puts me off changing entirely to Fuji-X. Not just their low capacity but also the lack of a proper battery level indicator. A warning when at best you have one or two exposures remaining isn’t enough. Of course it is useful to have cameras that know the time, at least when you have it set correctly. Once after I’d had to do a complete reset of a camera I got the year wrong, which rather upset the agency I sent the pictures to who rejected the work. Fortunately Lightroom or other software can change the date. But looking back at some old work on film, particularly on colour transparency, it can be hard to know which year it was taken, let alone which month, day or hour. Some transparencies are in mounts with a date stamp showing when they were processed, but many are not. With colour neg or black and white I’ve usually put at least a year and month on the negative filing sheets – indeed it is the basis of my filing system. Occasionally I’ve added a date and a place, either there or more often on the contact prints. Where I thought it appropriate I’ve added more details, sometimes including street names and grid references, but geotagging would have saved me many hours of work and probably have been more reliable. 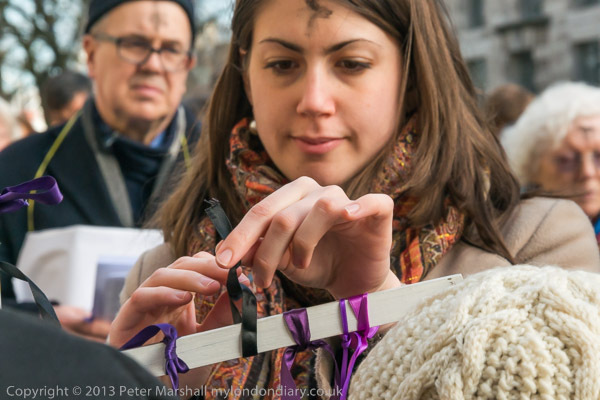 After Pancake Day follows Ash Wednesday, the first day of Lent, 40 days of penance, repentance, reflection and fasting in the Church calendar leading up to Easter, 46 days later (Sundays don’t count.) The 40 days reflected the 40 days Jesus spent in the wilderness being tempted by the devil, according to the Gospels. 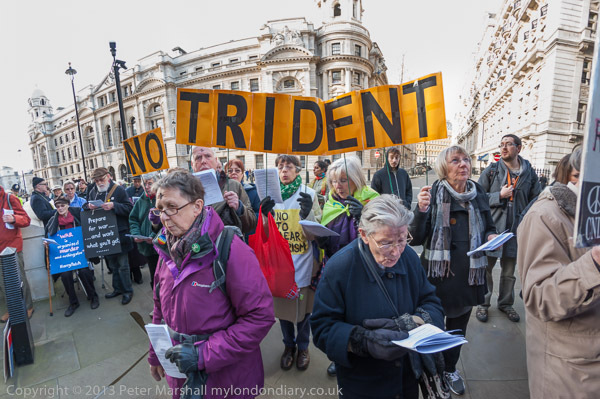 Every year since 1982, Christian peace organisations including Pax Christi, Christian CND and London Catholic Worker have observed the day with an act of prayer and witness at the Ministry of Defence in London, calling on them to repent from their deployment of weapons of mass destruction, and making use of the traditional symbols of sackcloth and ashes, though this year I think there was no sackcloth, though there were ribbons, being tied to a cross “in memory of a place/people in need of peace“. Photographing a religious event taking place in public like this I feel requires a certain reverence of approach, which sometimes makes it difficult to get exactly what you want. I think you have to be non-intrusive so far as the actual worship is concerned (not that photographers should get in the way at other events,) As a documentary photographer I try to alter things as little as possible, although of course there is always some interaction and our presence always makes some difference. But my heart always sinks when other photographers start arranging people and setting up pictures and getting in the way of an event. There are occasions when this may be appropriate. Press calls are events set up just to be photographed, although even at these I’d prefer to see how those taking part want to organise themselves rather than how photographers would like to take pictures. I can see why photographers do this, and much of the blame is down to picture editors who seem to have a peculiar attraction to the clichéd boring group shots that are too often the result. Occasionally during an event – though more often before or after – it may be appropriate to take portraits of some of those involved, directing them for your camera, but to try and do so during an event I think is disruptive to the event and those taking part and rude to other photographers. The streets are not a personal studio. It is sometimes a thin line between what is acceptable and what is not, but one which at events like this it is important to try and draw. A few years ago, photographing this same event, I perhaps stepped over it, and received a complaint from one of the organisers. Since then perhaps I’ve been a little more careful – or perhaps they have become more used to me. 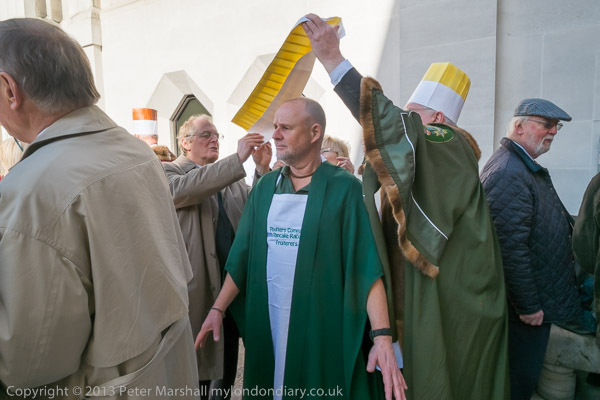 As I walked down the street after the service had finished with a couple of those who had taken part, they asked me about another photographer, complaining strongly about her getting in the way. I didn’t say much to them, but I was pleased when they also commented that I had been almost completely unobtrusive. It’s how I think it should be, and makes it easier for me – and other photographers – to work with these people another year. 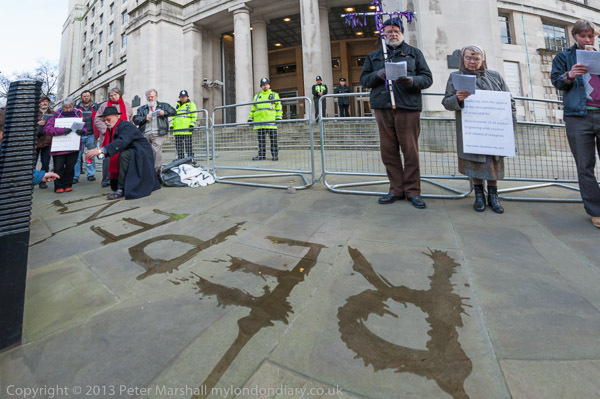 Fortunately for much of the event I had been the only photographer present, and was able to sit on the ground in the middle of things when the word ‘REPENT’ was traced out first in water, and then in ashes on the pavement in front of the Ministry of Defence. It isn’t easy to photograph, and I was glad of the 8mm fisheye to give me a very wide view (later converted to cylindrical perspective), as well as using the wide end of the 16-35mm. As a part of their witness, a number of those taking part try to mark the Ministry of Defence and War Office in charcoal with crosses and messages against war, and police are stationed all around both buildings to try and prevent this. It is a long perimeter, and people try from early in the day to well after the end of the service, making it hard for the police and for the photographer to catch them at it. Even when an attempt was most predictable, when the roughly 100 people present were lined up at roughly arm’s length all along the long low fence between the ministry and the gardens, it was hard to know which of them would jump over to try and make a mark as they ended saying the Lord’s Prayer together. I was some distance away when I saw one man jump over, and the police had caught him short of the wall by the time I was close enough to take pictures, but seconds later I was in the right place as he managed to pull away from the officer holding him and make a cross before the police again overpowered him. 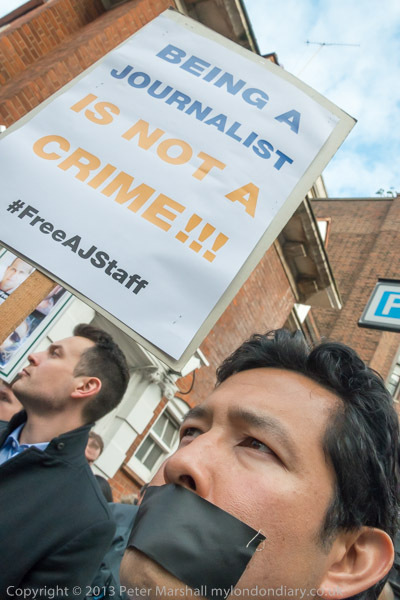 Fr Martin Newell was released a few minutes later, but ten days later was sentenced at Westminster Magistrates Court for refusing to pay fines of £565 imposed for a number of similar acts of witness. 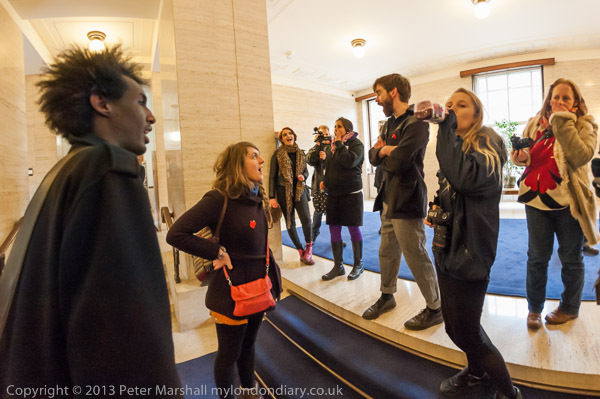 It seems fairly clear that even if the old War Office is a prohibited place (and it seems unlikely as it is no longer owned by the government thanks to a PFI leasing scheme) this does not ban photography by the public for non-espionage purposes. Tourists in their droves photograph this and the Ministry of Defence building on a daily basis. But certainly the police were rather upset at having been caught napping, and were probably expecting to get a ticking off later. But I’d taken my picture already, and wasn’t going to bother to stop and argue the point. I’ve often mentioned LensCulture here; it now styles itself as a ‘Global photography network and online magazine celebrating current trends of contemporary photography in art, media, politics, commerce and popular cultures worldwide’ though I still think of it mainly as one of the best on-line photography magazines. But its Editor & Publisher Jim Casper clearly thinks in a larger context, and it has organised portfolio reviews and and has a very wide range of photographer’s portfolios on the site – including a few of my May Queen pictures. And rather to my surprise I find that the new Lensculture exhibition which is coming to London is the 5th annual LensCulture Exposure Awards show. You can see work by the Award winners and finalists in 31 Contemporary Photographers at the London College of Communication, Elephant & Castle, London SE1 6SB from April 1 – April 5, 2014, 10 am – 5 pm. The work on show was from thousands of submissions by photographers from 62 countries and was selected by a nine-person international jury. Between them the six winners and 25 finalists represent 20 countries. Photography is indeed an international medium. Jim also asks me to share the invitation to the Opening Party for the show on Thursday 3 April, 2014 from 6 pm – 9 pm with all of you. I hope to see some of you there. Around 45 years ago, two young men, both with a mission about photography bumped into each other in the offices of the British Journal of Photography and got talking. Despite their very different backgrounds they recognised each other as kindred spirits and became good friends. One was the son of a respected English artist, who died only months after his birth, leaving his mother to bring up a family on a very restricted income; aided by support from various bodies including the Artists Orphans Fund she was able to send him to one of England’s oddest and most antiquated minor public schools, from where he went on to study to be a graphic designer. The other came from a large Irish Catholic family in the Bronx, where public schools were something rather different. But both had studied at separate times with the same man, Alexey Brodovitch, a legendary graphic designer and art director, and had experienced the vibrant photographic culture in New York in the early 1960s where they found both had many common friends. Both too had very little regard for the small clique that made up the British photographic establishment of those times, and then and later both made themselves unpopular by saying what they thought about them and their limited perspective on the medium. There is a considerable contrast between what some well-known names now say about Tony Ray-Jones and their relationship with him compared with their views expressed at least in private while he was still alive. John Benton-Harris continues to challenge with his widely-informed and forthright opinions on the medium. The two men photographed together very occasionally, with most of Ray-Jones’s pictures being made outside London and most of Benton-Harris’s in and around the capital – John says they agreed to split the photographic country between them along these lines. But they worked together in other ways, educating the editors of Creative Camera and introducing them to many of the American photographers whose work they published, and John printed much of Tony’s work, both before and after his death. The show did contain at least 5 prints he had previously owned for many years, and probably other prints in the first section were among those he had printed for Tony Ray-Jones; certainly the majority were from negatives from which he has printed. So I was very interested to hear John’s opinion on the show ‘Only in England‘ which featured both work that was printed by (or probably mainly for) Ray-Jones during his lifetime and also new prints made from work that the photographer had rejected as not being good enough. After its showing at the new Media Space in London’s Science Museum, this opens today (March 28) at the National Media Museum in Bradford and continues until 29 June 2014. After I’d written my own review of the show (and earlier I’d posted a short note based on the promotional video), I had some lengthy conversations with John, and was pleased to hear that he was busy writing his own review. Since then I’ve asked him quite a few times how he was getting on with it and finally yesterday he was satisfied that it was complete and ready to be seen. The review reads very much in John’s own voice and expresses his views about both the show and some of the aspects of the rewriting of photographic history it represents. John did give me permission to put the whole of his review on this site, and I may do so later, but for the moment you can read it on his The Photo Pundit blog. I was pleased to find that his view is largely similar to what I had previously written about the show, though his close knowledge of both the man and his work gives his view a much greater weight. There is quite simply no one who can speak about Tony Ray-Jones and his photography with greater personal knowledge and authority, although many still seem to want to ignore his views. And, also on John’s blog there is a great bonus. On March 7, artist Edward Mackenzie, another English former Brodovitch student (he recently moved back to this country and set up his studio in Stoke-on-Trent) gave a talk at the Media Space, about Tony Ray-Jones who he met in New York in 1966 him along with Tony’s brother, Philip Ray-Jones. You can see the two of them in a photograph at the top of another post I helped John put on-line yesterday which is the text of Mackenzie’s talk. It’s an interesting and slightly different perspective of both the man and his work. It’s great to see an old friend of mine getting some of the recognition he deserves and the article on the US Slate magazine Portraits of the London Punk Movement of the 1970s and ’80s by Sophie Butcher, published yesterday when Derek Ridgers was signing copies of his latest book at a New York book shop, has some large images of his work. In the piece Derek says “I’ve documented clubs for five decades. I’ve got a 240-page book in the making (about that period titled The Dark Carnival). You could say I don’t need any more photos, so I’ll stop when I get a publisher for the next book”. Though I’m not sure I believe him about stopping. 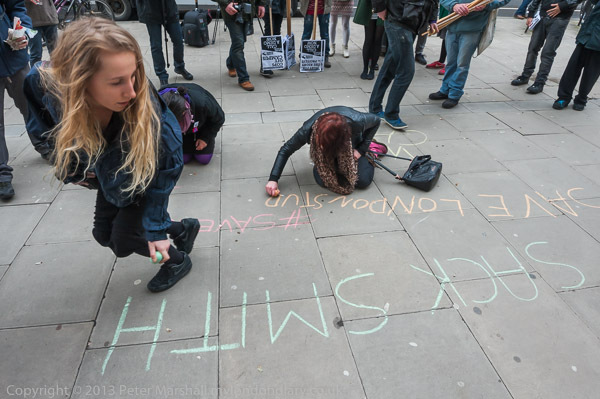 I’d really gone up to London not just to photograph the City pancake event and meet up with a couple of other photographers but to visit SOAS where the cleaners were on the first day of a two day strike to gain equal treatment to other staff working there. The picket line had formed at 4 am and apparently by 6 am, the normal shift start time, almost the full normal morning shift were there taking part. 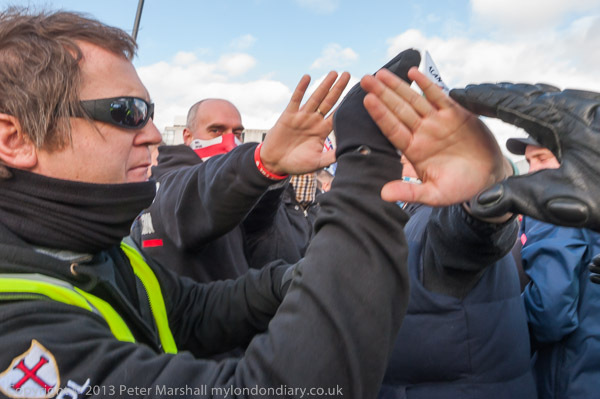 It’s too far from where I live to get there for the early morning – I’d have to stay up in London overnight to cover events that early, so instead I went to the lunchtime rally that they were organising. 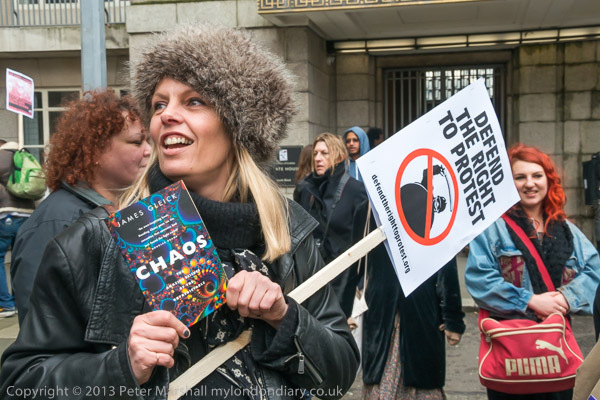 I left the pancake race early, arranged to meet my friends in a couple of hours time in a pub in Holborn and got to SOAS just as the rally was about to start. 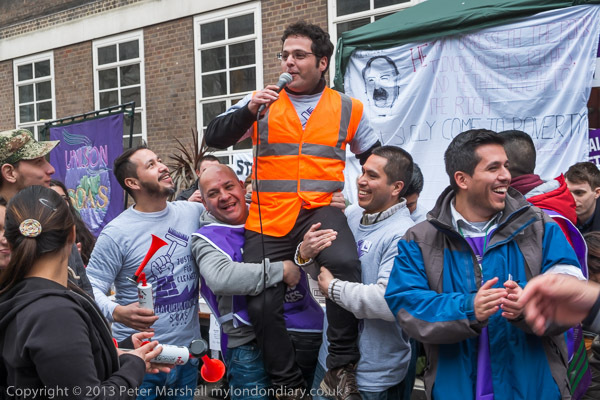 The cleaners at SOAS belong to Unison, and the SOAS branch has there has actively pursued their fight first for a living wage and now to be brought back in-house and to get decent pensions, holidays and sick pay – with the slogan ‘One Workplace, One Workforce’. 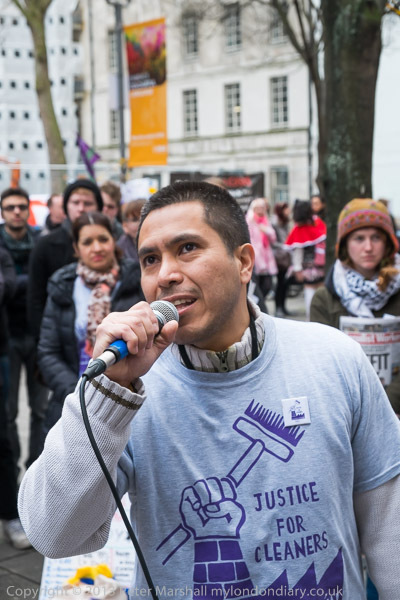 Of course at a rally you photograph the speakers and the people listening, looking for ways to connect both with the event – easy in this case because so many were wearing ‘Justice for Cleaners’ t-shirts or Unison tabards or holding posters. There were some large banners too, though not always easy to photograph – it was quite hard to see the red text on the one in the picture below, and harder still in photographs. But perhaps what you don’t expect to find on a picket line is a band (or perhaps I should call it an orchestra) playing Latin American music and people dancing. And it was the people dancing who created problems for the Fuji X-Pro1, with well over half the images showing them slightly out of focus. The 14mm focuses pretty rapidly most of the time – fast enough for the delay to be hardly noticeable for static subjects – but was totally unable to keep up with dancers at close distances. It’s a habit I’ve got out of using cameras with fast autofocus, and also slightly less useful. Using manual focus on the Nikons isn’t always easy, as the viewing screen isn’t really designed to make it easy to judge sharpness, and with zoom lenses the depth of field scales if present are only rudimentary. Lenses too are designed with a different ‘feel’ to the distance ring; in the old days although they moved smoothly a little more effort was required to start them, while with most modern lenses the slightest accidental touch may shift focus. When I set the lens at 1.8m in the old days, it would still be at 1.8m until I deliberately moved it to a different distance, but most lenses just work like this now. The 14mm is a very nicely built lens, and it does have a depth of field scale, although it is rather more conservative than the figures I give above (the actual figures depend on an assumption about how sharp things need to be to seem sharp – the value of the ‘circle of confusion’.) Optically too, it is virtually perfect. But I’d like just a bit more feel on the focus ring. All equipment has its limitations, and automation isn’t always the best answer. I got enough pictures with the Fujis, but its always annoying to lose things, and as usual it was some of the best that were not usable. On the plus side, I really appreciated having a much lighter bag – with the much of the weight being essentials like a book to read on the train and a bottle of water. Two Fuji bodies and three lenses – including the Samyang 8mm which I used in the pub later – hardly seemed to weigh anything. Even with neck straps and the several spare batteries you need to carry the whole kit weighed only just over 4lbs. More pictures at SOAS Cleaners Picket Line. 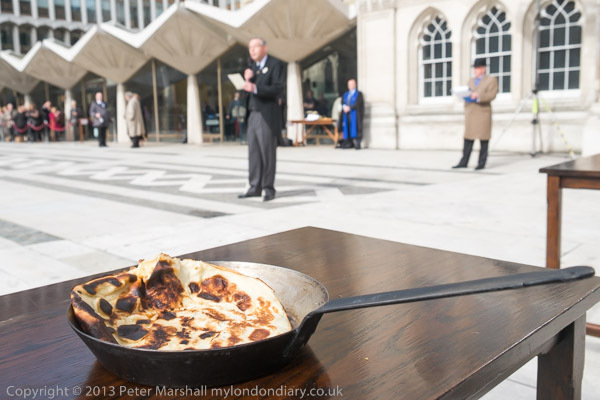 I only really went to the City of London Pancake Races this year to meet up with other photographers. It’s an event I’ve photographed a number of times in previous years and I don’t really feel I had anything new to say about it. It does have a certain surreal quality that I find amusing, and those taking part also obviously find it a day to at least metaphorically let down their hair a little, though this doesn’t stop the competition being rather cut-throat – as one might expect from the City. 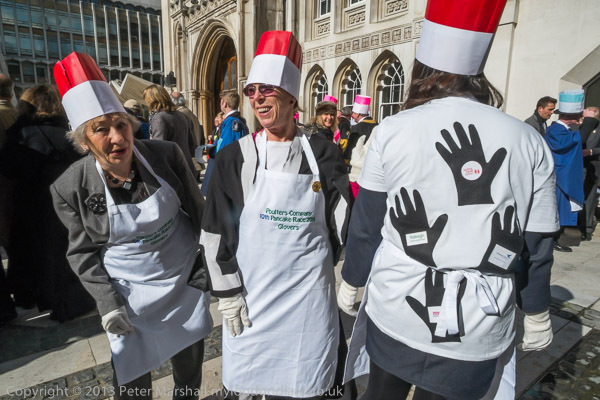 It is of course all in a good cause, or rather good causes, with monies raised going to the four charities chosen by this years Lord Mayor – who this year was for the second time in the City’s history a woman, Fiona Woolf, a lawyer specialising in electricity industry reforms. Beating Bowel Cancer, the Princess Alice Hospice, Raleigh International and Working Chance perhaps were rather harder to interpret for the fancy dress competition than some in previous years. 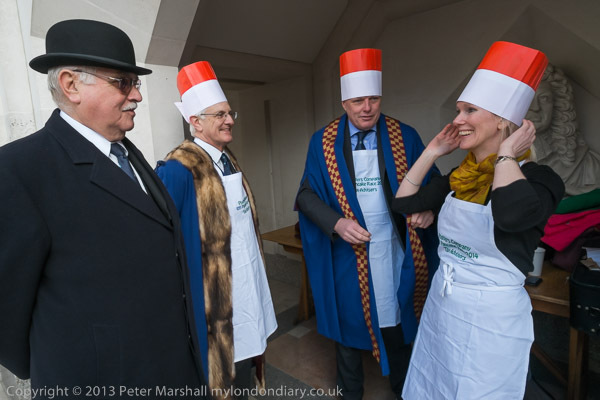 There was a small series of images of one of those taking part having his hat put on that had the quality of some ancient crowning ritual that rather amused me – this is the first of four on the web page. It’s partly those hands stretched down, but the robes give it something of a masonic or even druidic feel. 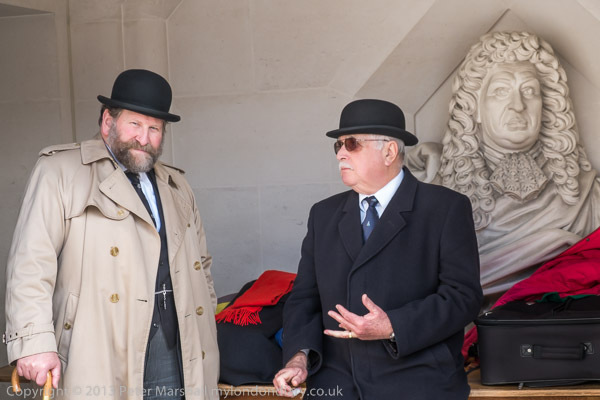 One of the photographers I had gone there to meet was John Benton-Harris, and it was an event that reminded me of his work from his early years in this country in the late 60s and 70s, a series of ‘Mad Hatters’ which forms a part of his commentary on the English class system. Also present and taking pictures was another well-known photographer, Martin Parr, currently working on a project in the City of London. I’d not expected to see him, and found on talking to him that this was the first time he had photographed the event. I’ll be interested to see what he made of it – and the rest of the City. It was one of the first events I’d deliberately decided to photograph using Fuji X cameras, with the 14mm f2.8 Fuji lens on the X-Pro1 doing most of the work but with the 18-55mm on the EX1 body. I didn’t attempt to photograph the actual races and the rest of the event is relatively static, and the 14mm (21mm equivalent) was great working in the sometimes quite restricted places in the crowd. Although it is a relatively large lens, the camera is still pretty unobtrusive compared to the Nikon – especially with the huge 16-35mm f4 wide-angle. Had I brought the Nikon I might well have chosen to work with the 20mm f2.8 Nikon lens rather than the zoom on this occasion. But the really important difference is in the noise. Working at close range in a generally fairly quiet event (except for the starter’s cannon and the shouts of support during the actual races) the Nikon’s shutter is unmissable, while the Fuji was a whisper by comparison – even I could hardly hear it. Far less obtrusive than a Leica! 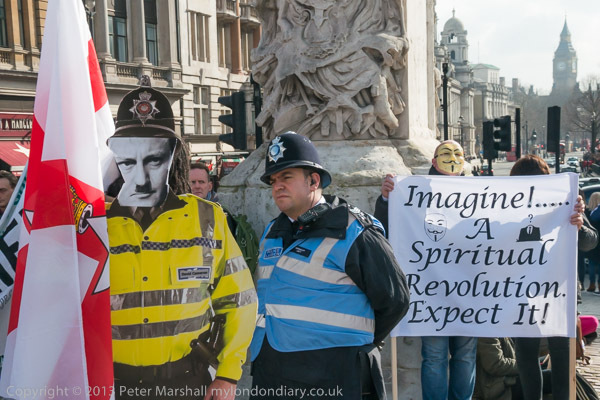 It was a protest against “the corrupt systems governing the world, bankers and the military-industrial complex” in the tradition established by the Occupy Movement, and it was hard not to sympathise which much of what people at it said. I used to think that although our government was corrupt it was at least less corrupt that most of the rest, but under the present coalition I’m rather less sure of that. I remember back on the morning when the story about UK Members of Parliament expenses broke in May 2009 with the leak being published in the Daily Telegraph that really this was an unimportant story. And although it seemed to occupy most of the papers for the next year or two it still seems to me pretty trivial compared to the other scandals the press should be investigating and reporting. But it’s easier to write about duck houses than dig the real dirt. And today some of the papers are wasting space about claims for spectacles for staff who use computer screens, and suggesting that £354 is a ridiculous amount of money for the taxpayer to fork out. A little research would have told the reporters concerned that if – like my wife – you have a complex prescription, the lenses are expensive and need special frames. The amount they were getting worked up about it is about what her last pair cost. Mine cost about half that, but still rather more than the papers seem think a pair of glasses should cost, though I usually choose around the cheapest frames my optician has on offer. But given that Parliament is spending (and at times wasting due to incompetence) billions of pounds getting worked up about a few hundred pounds makes no sense. The fuss about expenses is all simply a distraction from the real corruption and scandals in the system. Which occasionally we get to know a little about, generally not from the work of mainstream journalists but from leaks by whistle-blowers like Edward Snowden, from bloggers and particularly from Wikileaks. 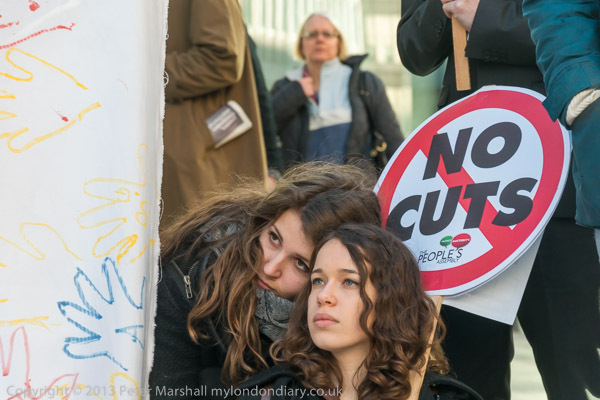 The Occupy movement has done much to make clear the links between government and big business at all levels, and to at least sketch out that other ways of doing things are possible. 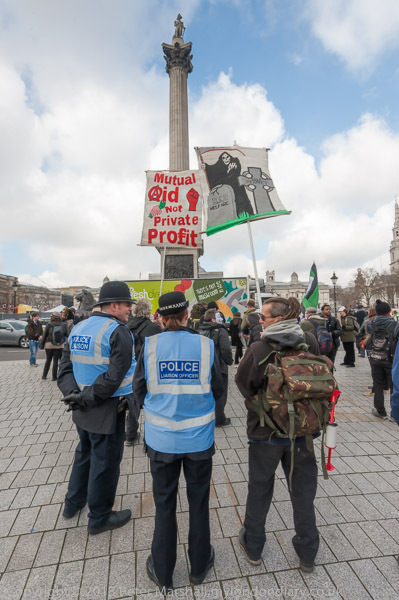 As you can see from the picture above, the event started at Trafalgar Square, with Nelson above and police below keeping an eye on events. 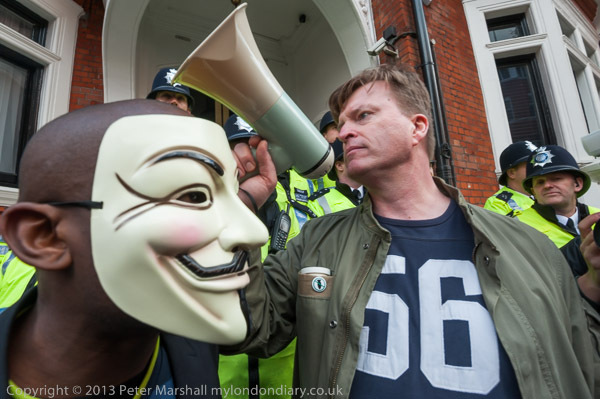 Though I don’t think the police liaison officers were actually spying on the protesters who will almost certainly have included at least a couple of plain clothes police whose job it is to keep in touch with such things, if not the odd undercover officer. One protester actually came with a copper on his back (the face was rather familiar) and was carrying an Ulster flag. I talked to him after his conversation with one of the police and found he had come over from Northern Ireland to London for the protest. Taking pictures at an event like this isn’t just about making pictures, but also about conveying the message and of showing what the event was like. The two things don’t always go together and it annoys me to see the newspapers use images that make striking pictures but are superficial or only trivially about the event they were made at. 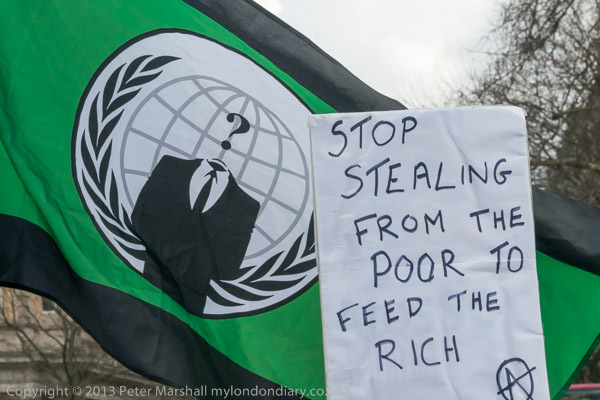 Of course the simplest way to connect images with the message is through words on placards or obvious symbols such as the Anonymous flag or mask. 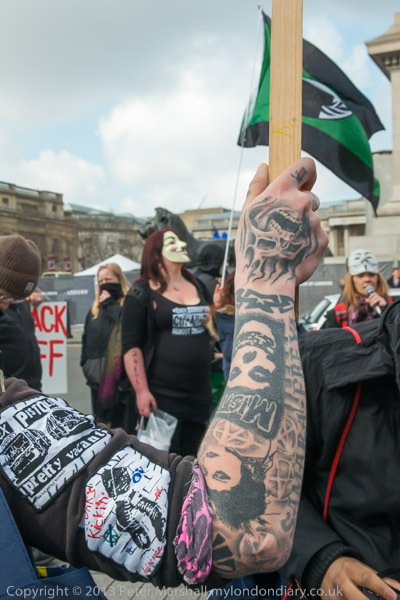 In Against Worldwide Government Corruption you can see a series of pictures in which I am working hard to try to make a picture using the rather fine tattoo above. It proved to be difficult, as it was a moving subject, and the other elements I was working with were moving too – including a flag blowing in the wind which always tends to be frustrating. The main problem I had was with other people walking into the area in front of me to take pictures. It would be so much easier to set things up, to direct a scene rather than photograph actual events, but this would be falsifying things. And it would not leave room for the magic of the unexpected which can be so much more exciting than a preconceived idea. But though I tried hard I don’t think it quite came off. Quite a few pictures that almost work, but I never got to one that really sprang out at me when I saw the result on screen. 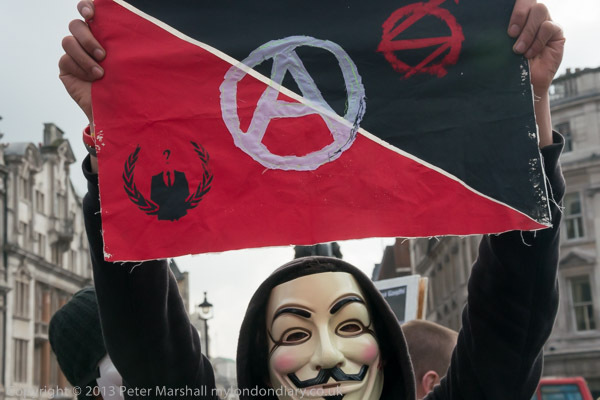 There was something of a happy accident about the image of an Anon holding an Anarchist Anon flag above his head. I took it with the 18-105mm on the D800E, where the DX lens gives a dark line frame to show the actual image area. Its something I rather like, though it makes the viewfinder image just a little small, but it is great when you want to frame precisely, giving the DSLR a similar (but much more accurate) facility to a Leica. But here I was too hurried (perhaps because I was standing in a busy road in the way of traffic about at any moment to be given the green light to drive at me) and as I pressed the shutter realised I had framed using the whole visible image rather than the DX frameline. I’d seen the top of the flag and the chin of the mask in the viewfinder but immediately realised they would not be in the picture. I took a second exposure putting these elements inside the frame as I’d meant to, but on seeing the two images decided it was better with them cut off. Another picture I took a couple of variations of – and they are both in My London Diary – was of a woman holding a poster with the message ‘F**k Cops’, with a police officer standing behind her. It’s the contrast between the two figures, their expressions, body language and clothing – as well as the poster – that make this image work for me. Taking pictures of some of the people and events I photograph, it is impossible sometimes to avoid bad language in pictures. Sometimes there are things that might offend people, although standards have rather changed. But I think few people now would object to seeing ‘F**k’ in an image, though they might find ‘F**k Cops’ less acceptable. While 20 years ago I might have thought twice about sending the picture to an agency now it wouldn’t occur to me it might be a problem. 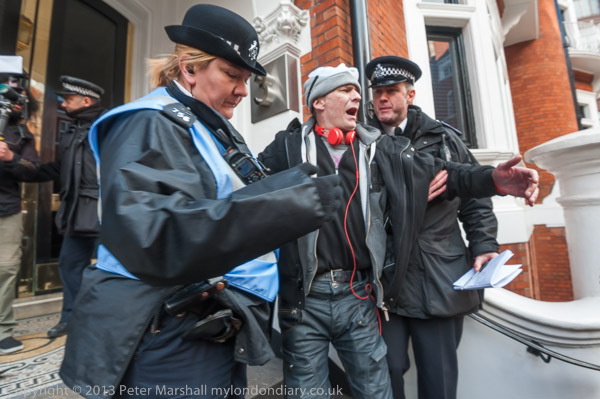 From Trafalgar Square the protesters moved on to the Ecuadorian Embassy, where Julian Assange has been holed up since June 2012. 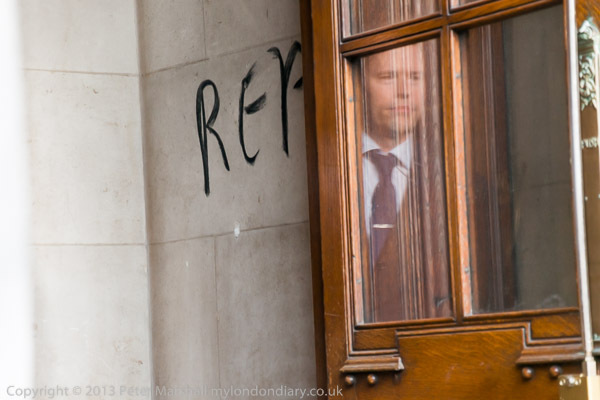 It was entirely predictable that they would make an attempt to enter the building, though the police and most other photographers were slow to realise this. So I was in a good position when it happened, though soon with photographers shoulder to shoulder on both sides, and unable to move or even change a lens. But I was in the right place and prepared for the picture at the top of this post, unexpected though it was. More at Against Worldwide Government Corruption. Well, I almost kept that resolution to keep things on My London Diary more or less up to date, but then really messed things up by forgetting about the last day of the month for a couple of weeks. In mitigation it has been a rather busy time for me, with a real ferment of protest as well as a few other things, and February itself was rather a mess. Not least that for 13 days we lived without any mains drainage in the house which caused a few problems and certainly made us appreciate how much we rely on such services. But we were lucky to avoid actual flooding and the water in our street didn’t come into our house. 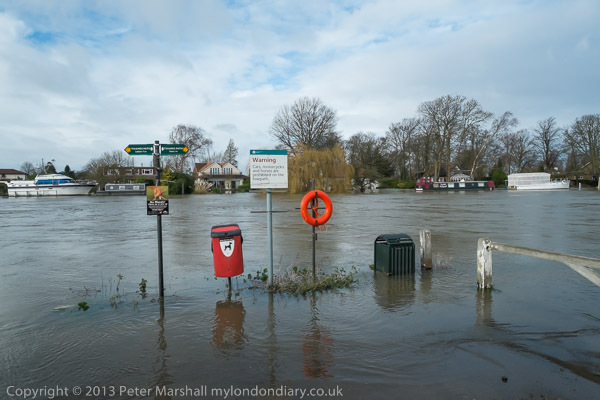 The river level here now is 1.91 metres – 6ft 3 and a bit inches – lower than at its peak. There are still places around where you can see the mud it has left behind – and clearing up is still going on and will be for months in homes that were flooded and at least one local basement is still having to be pumped out. February isn’t a month we will forget quickly around here, though I failed to take any memorable images of the floods. Most of my work was as usual in the centre of London, still protected for the moment by the Thames Barrier from tidal flooding, and possibly by the lack of dredging in upstream areas like ours from flooding by the Thames. Getting on the train to London seemed often to be going to a different world where roads were not blocked and toilets still flushed. Anyway, here is the complete list. I was sure I’d finished posting my work for February on My London Dairy a couple of weeks ago, and was congratulating myself on being almost up to date. Then, a few days ago I found that although I’d published a few things from March, there were still a couple of things from the last day of the month, Feb 28, that I’d somehow neglected. 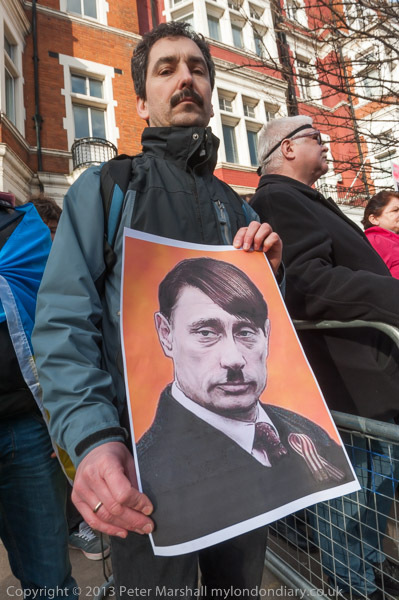 One has come back into the news – and even at last made the mainstream – in the past few days. 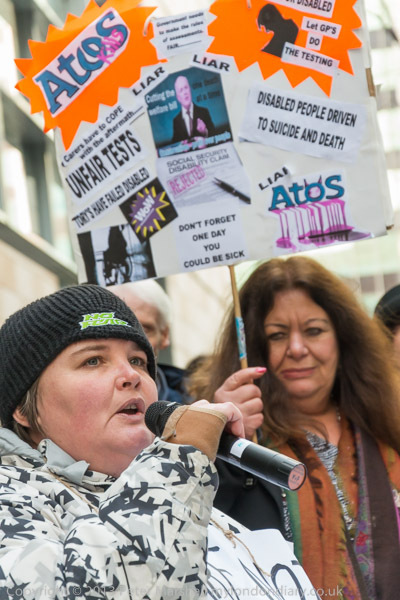 Last July the woman speaking in the picture below was arrested for chalking slogans about the 3Cosas campaign cleaners’ struggle for decent pay and conditions across a foundation stone at the Senate House. I wasn’t there when Konstancja (Koshka) Duff did this, nor when she was arrested with unnecessary force later, and charged, following pressure from the University for her to be charged. 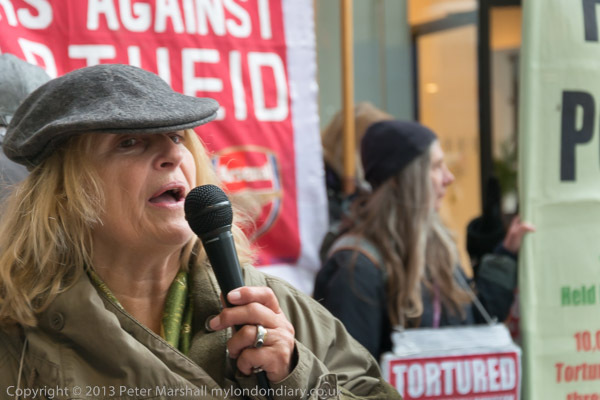 In the picture I took the following day when she spoke at the 3Cosas protest at Senate House, signs of her beating by the police were clearly visible. 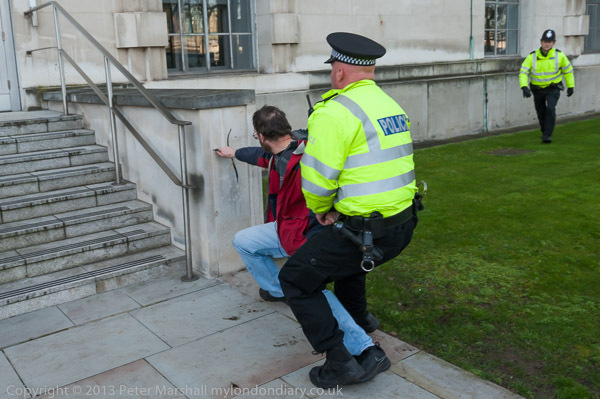 The caption I wrote in July was “They claimed chalk caused damage and was expensive to remove. I find a damp cloth works well“. A couple of days before the protest at the end of February her case finally came to court. The police, having mistreated her on arrest adopted what appears to be their normal tactic of charging her with assaulting the police officer and special constable involved, but fortunately for her video and photographic evidence showed that the police accounts were not not consistent with events. The judge said that one had “exaggerated her evidence” and the other had clearly not been in a position to see what he had described in court, having been behind the van door, and dismissed that charge. Of course there is no chance that the officer who assaulted her will ever be charged with that crime, despite many witnesses and video evidence, nor that either will be charged with perjury for lying under oath in court. Although the university authorities now deny it, there can also be no doubt that the arrest and prosecution only occurred because of pressure from the University of London’s deputy director of property, Paul Nicholson-Lewis, who, according to police evidence at the trial was “very keen to press charges”. Although the major charge of assaulting a police officer was thrown out, Koshka Duff was still treated very harshly by the court, with the judge in a highly curious ruling reported in London Student, rejecting Duff’s claim that she had chalked on the stone to advertise the following day’s 3 Cosas protest and finding her guilty of criminal damage, ordering that she pay £810 to cover the cost of repairs to the stone and £200 towards prosecution costs. You can donate to the Chalk Fund to help her pay the fine. 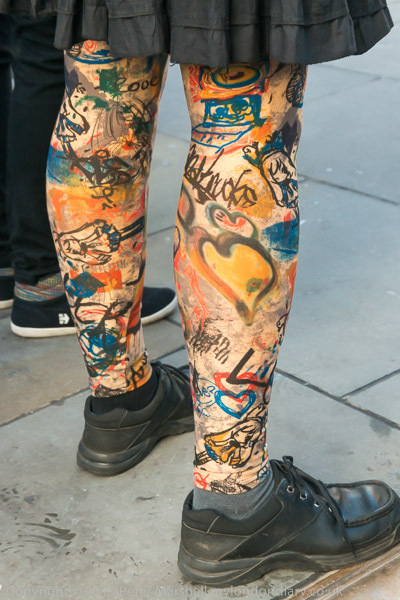 The case made the news again after an open letter signed by 49 academics mainly from London University colleges to the university gave advice that a damp cloth could be used to remove chalk and helpfully enclosed several cloths for future use. The high cost of cleaning – the £810 charged to the student – appears largely to be because the unnecessary use of high pressure hydrocleaning damaged the gold lettering which had to be replaced. So the protest against the University Vice-Chancellor began with some highly symbolic chalking on the pavement, demanding that he resign. Not just over the chalking affair, but because of the increasing bringing in of police onto the campus, over his decision to close the student union, his failure ensure that outsourced staff working on the site are given decent conditions and more. It took place very quickly and it wasn’t easy to find a good angle to photograph. I also wanted to make what they were writing visible in the images, which meant photographing as they finished it. 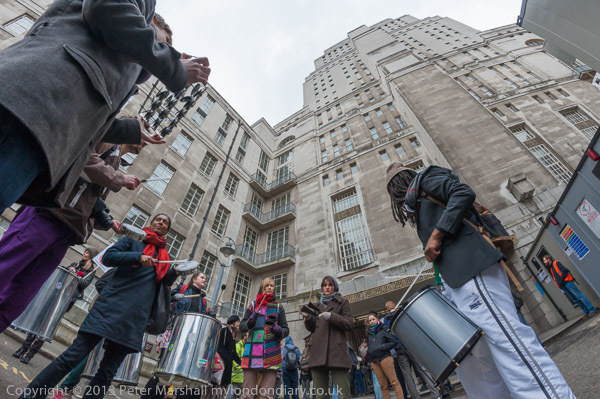 Students protested outside Senate House, and the gates at its base were locked. Someone opened a fire exist and they went inside to protest, hoping to find the meeting of Vice-Chancellors, but it appeared to have been moved elsewhere. 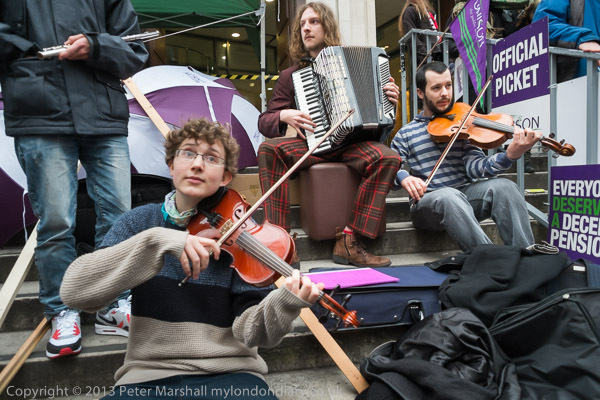 They were careful not to cause damage and clearly were not intending to occupy which would have been in defiance of a High Court injunction obtained by the University management against its own students. I went outside as some students climbed out onto a balcony and watched from outside as they went through an open window into the Vice Chancellor’s offices, where they apparently went through some of the files. But by this time I was elsewhere. 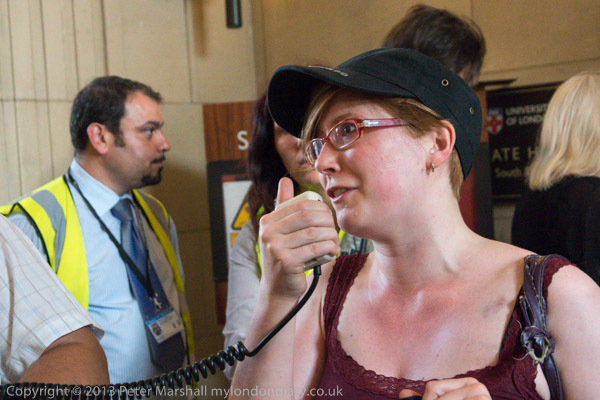 More pictures and about what happened at Students tell Vice Chancellor to Resign. Elsewhere was a protest against security company G4S outside their offices in Victoria Street, one of a number of protests for International Israeli Apartheid Week. 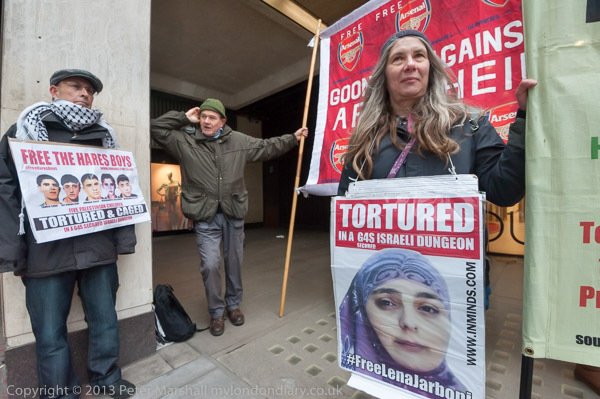 G4S runs a number of prisons in Israel and you can read more at G4S & Israeli Prison Torture. You are currently browsing the Re-photo blog archives for March, 2014.